Wiltfong signed to play football at FHSU and is one of the best wrestlers in 3-2-1A at 220. Norton senior Hayden Wiltfong and his family lived a block away from his grandparents, Jim and Sherry Showers, in Edmond. Wiltfong and his brother, Judson, were very close to their grandfather and saw him often. Jim, 73, was in poor health and passed away Jan. 10 at KU Medical Center, the day before the prestigious Newton Tournament of Champions wrestling tournament. Michelle Wiltfong, Jim’s daughter and Hayden’s and Judson’s mother, was with her father the entire week in Kansas City. Michelle told her sons that Jim would want the boys to compete at Newton. Wiltfong took third at 220 pounds and had the top finish of any Norton wrestler. He defeated multiple ranked wrestlers by fall, and only lost to Newton’s Wyatt Hendrickson in the semifinals, his first defeat of the year. Hendrickson, an Air Force commit, has been ranked third nationally. Judson, a junior, finished 3-2 and had a solid showing at 195 pounds. After Newton, Hayden stood 15-1, Judson 16-6. A week later, Norton dualed Colby at home in a matchup of top 3-2-1A schools. The dual started at 195 so Hayden and Judson could leave early and attend the family viewing for their grandfather. Hayden, currently ranked second in 3-2-1A, pinned Colby senior Tucker Branum, ranked fourth, in 90 seconds. Branum scored an early reversal. At that point, Hayden had only allowed points to two wrestlers all winter: Hendrickson and Branum. Hayden is a two-time state placer with fifth as a sophomore and fourth last winter. 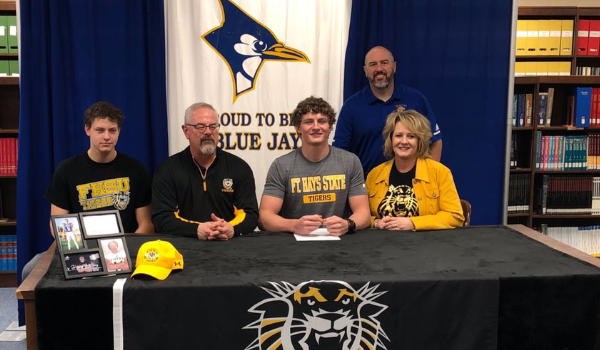 While Hayden has helped lead a Norton wrestling squad that has vaulted up the rankings this winter, he also recently signed with Fort Hays State for football on National Signing Day last week. The 6-foot-6 Wiltfong started at tight end/defensive end for Norton last fall and had received scholarship offers to Butler County, Dodge City and Division IIs Emporia State, Washburn and FHSU, the two-time defending MIAA champions. Wiltfong also had a preferred walk-on spot from Kansas State. In his career, Wiltfong had 211 career tackles, 30 tackles for loss (16 this year), 23 sacks, seven forced fumbles and 54 catches for 698 yards and eight scores. Fort Hays coach Chris Brown offered Wiltfong later than the other schools, his standard practice. Norton is a longtime wrestling powerhouse with Johnson, including five straight titles from 2013-17. This year, the Bluejays have just 17 wrestlers. At the start of the season, Norton was not ranked in the top-10. Cole Amlong was third at 160, and Wiltfong was second at 195. Johnson routinely has wrestlers significantly improve throughout the winter and earn state medals after they had little in-season recognition. Johnson has a theme each year and has considered the “Norton No-Names” this season. “That’s what I strive for every year is to get somebody (placing) that nobody knows about,” Johnson said. The Bluejays have moved as high as second in 3-2-1A and currently sit third behind Colby and Eureka in a wide-open classification. Norton will compete at the 3-2-1A WaKeeney-Trego regional this weekend with state the following week in Hays. Freshman Darius Schields (26-9) is ranked sixth at 106, junior Brandon Vacura (24-5) is fifth at 160 and Judson Wiltfong (24-9) is among the top wrestlers at 195. Amlong (21-6) bumped to 170 and is third, while Hayden has sat second to Ell-Saline’s Nick Davenport. Junior Camdyn Unterseher (22-7) was ranked No. 1 at 126 in the Jan. 22 poll. At Newton, Wiltfong won by fall over Derby’s Tyler Allen in a minute, then defeated Marion’s Charlie Nordquist by fall in 43 seconds. After the Hendrickson loss, Wiltfong pinned Goddard’s Trenton Willert in 39 seconds. In the third place match, he pinned Wichita Northwest’s Josh Carter in 1:49. Wiltfong is well-known for his pins. Including out of high school competition, Wiltfong is 31-7 in the last year with 30 pins, according to his Track Wrestling page. On Feb. 2, he lost to Davenport, 3-1, in the final of the Phillipsburg tournament. Davenport is 30-0, and Wiltfong is 23-2. Sports in Kansas and Nex-Tech Wireless are in partnership over the 2018-2019 school year to release a Central Kansas and Western Kansas Athlete(s) of the Month, two separate monthly honors. Schools west of Russell, Kansas (including Russell) in the Nex-Tech Wireless footprint (click to see) qualify to be nominated for the Western Kansas Athlete of the Month and schools East of Great Bend (including Great Bend) qualify to be the Central Kansas Athlete of the Month (click to see). You can nominate an athlete over the last seven days of the month by emailing Chet Kuplen at sportsinkansas@gmail.com, please provide stats. Nex-Tech Wireless is a proud supporter of Sports in Kansas, visit them online at www.nex-techwireless.com. © 2019 Sports in Kansas, LLC. All Rights Reserved.